The Sherman Studio isn’t just a place to see great drama. In this new addition to our programme, the Studio transforms into an intimate comedy club. 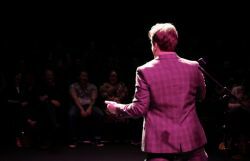 Every Comedy Club night features a fantastic compere, one of the best headliners on the circuit, an opening act and spots from two of the brightest local comedians. With over two hours of top quality comedy for just £9, regular drinks promotions and a buzzing atmosphere, the Studio Comedy Club offers an unbeatable night out.